Oracle DRM Analytics is a product that consists of a set of dashboards and reports for the Oracle Data Relationship Management application. It was initially made available in March 2016 with PSU 11.1.2.4.330 and it has been enhanced in future PSUs. Oracle DRM Analytics Dashboards for DRM Master Data Change Tracking, Growth Analysis, DRG Request Monitoring, DRG Workflow Model Performance, DRM/DRG Participant and User Group Performance. Different from the Data Relationship Governance module, DRM Analytics can not be accessed directly from the DRM application. Users have to setup an Analytics URL for the Dev, Stage, Prod environments, then setup a Web server and finally link it to the DRM database to get the data. There is a shortcut icon available within the DRM application that will navigate to the DRM Analytics URL which can only be configured by the DRM Admin. Most dashboard data in DRM Analytics is not refreshed automatically, that is why users have to manage Execution Plans. Check the sections in the DRM Admin Guide for more information on how to setup DRM Analytics. In the Filter section, users can choose to see data for different DRM Versions, Hierarchies and Node Types for different time spans. In the Change Method field, the user can differentiate between data that was added via DRG workflows or data added directly into DRM, since in many cases not all DRM data changes might have been automated. It would be useful for this field to have a multi select capability so that users have the choice to see all changes to DRM data despite of the way it was added in the application. Users can also see Property changes and visualize the trend of changes. When users drill down to see the details of the changes, they’ll be able to detach the table to a larger view, reorder columns, display only relevant information, as well as export the data in Excel. In the Request ID column users will be able to see additional details of a DRG request, however once clicking on the id, they will be moved to the DRM application since this type of information is not stored in the DRM Analytics module. In the above image the user could see metrics on the DRG Workflow model performance specific to cycle time, average request items, and average participants because the “Sort By” was by Count. However if the “Sort By” filter selection is changed to Participant Name, the user will see metrics on the behavior of individual participants for that particular DRG workflow model. 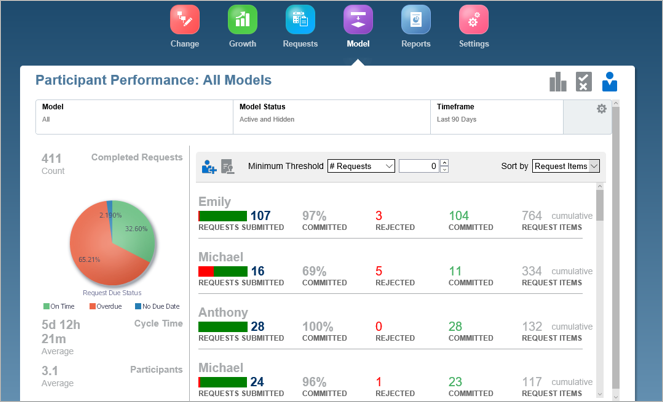 Another insightful way to look at participants’ performance is across all DRG workflow modules. To do that, the user needs to select “All” in the “Model” field filter and adjust the other filter criteria for Model Status and Timeframe. Afterwards, the user will have a clear understanding of the DRG workflow participants need to be trained to adhere to data management procedures based on the number of rejected, overdue requests associated with that particular participant. User Role Assignment Report––Provides a list of users by role or roles by user with counts by licensed user types. Access Group Membership Report––Provides a list of users by interactive and workflow user groups. User Login Activity Report––Provides trend reports for user login activity over time. Metadata Object Usage Report––Provides frequency distribution and aging information for Data Relationship Management objects: queries, compares, imports, exports, blenders, and books. Object Access Group Authorization Report––Provides mapping of users and user groups to specific Data Relationship Managementobjects. Hierarchy Access Group Assignment Report––Provides data grants of users and groups to nodes in a hierarchy. Workflow Access Group Assignment Report––Provides data grants of users and groups to workflow model stages. Draft DRG request metrics are not displayed in any of the dashboards. Even though it makes sense to see details of Committed DRG requests in a dashboard, DRM Analytics Managers are interested to see the number of Draft requests that are pending to be submitted. This is especially important during quarter close periods. There is no dashboard or report that displays DRG Property Value details. Most dashboard drill through views display data at the DRG Request and DRM Item level, however the Property Details that are added/updated for a DRM node can not be readily seen unless the user logs into the DRM application. This functionality would be useful because the metadata is what gives the master data meaning. Currently DRM Analytics doesn’t have any reports to display DRM specific validations and DRG validations for each workflow model. DRM data quality relies heavily on validations so the product should offer an accessible way for all kinds of users to review validations and propose changes as well. It would be useful to have the ability to create customized reports either through the DRM Analytics Interface or through a behind the scenes scripting functionality that doesn’t require DRM Admins to tackle back end tables to retrieve this kind of information.